The history of the railroad lines that first connected Cleveland with the outside world is one of struggle and labor; of disappointment, loss, and final triumph; of patient endeavor on the part of patriotic citizens; and of a faith than held its own until the day of results that was a justification of all that had gone before. This city owes a debt of gratitude, that can never be repaid, to the little band through whose energy and capital her first railroads, and therefore her subsequent prosperity, were made possible. The modest local line, that for a time connected Newburg and Cleveland, has been described. Other lines of similar character were proposed from time to time, but they came to nothing. 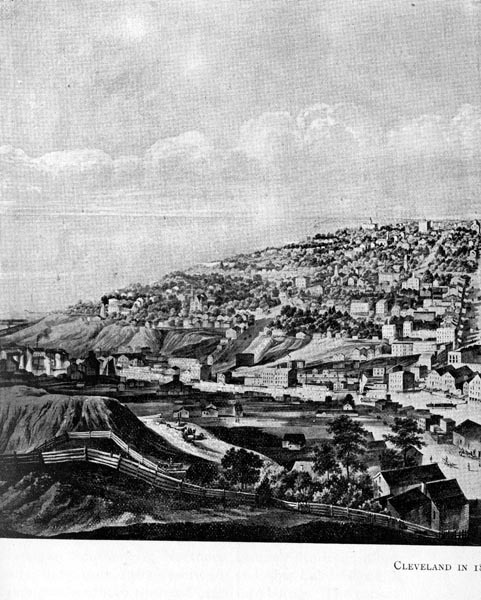 The first of any moment that proposed to make Cleveland one of its stopping places, of which we can find record, was an ambitious project suggested by DeWitt Clinton (not the governor), in 1829. 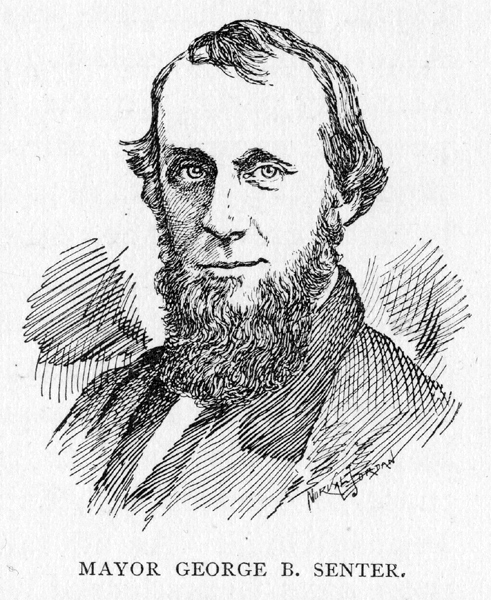 He published a plan of a line to be called the Great Western Railway, that was to find its starting place in New York City, thence to the Tioga and following that, intersecting the head waters of the Genesee and Allegheny rivers, thence to Lake Erie, following its southern shore line, crossing the Cuyahoga, Sandusky, Maumee and Wabash rivers, and on to where Rock River enters the Mississippi. The route covered a distance of 1,050 miles, and the estimated cost was fifteen million dollars. It is perhaps needless to say that it was never built. with a plan that was to secure al the benefits of the railroad at a cost far below that of lines already built or in course of construction. This was to be accomplished by placing the tracks on a double row of piles, or posts, upon which planks were to be placed edgewise, and bolted together. The Ohio Railroad Company was organized at the Mansion House, Painesville, on April 25th, 12836. Its incorporators were: R. Harper, Eliphalet Austin, Thomas Richmond, G. W. Card, Heman Ely, John W. Allen, John G. Camp, P. M. Weddell, Edwin Byington, James Post, Eliphalet Redington, Charles C. Paine, Storm Rosa, Rice Harper, Henry Phelps, and H. J. Reese. In considering the expansive charter under which the company was to work, we must remember that it was obtained at a time when state legislatures were disposed to grant anything to corporations that promised to create great wealth out of nothing, and when the country was in the wildest state of speculation of that great speculative decade. 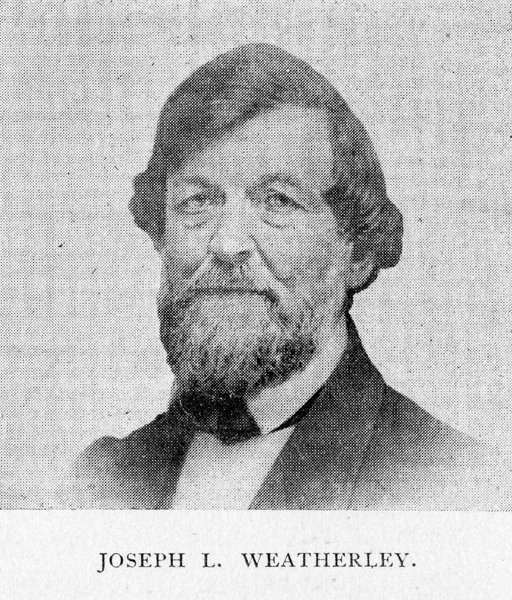 It was obtained through the efforts of Nehemiah Allen, of Willoughby, who then represented his county in the Legislature, and who became president of the company. two-thirds had been paid in "to the companies organized to build railroads," etc., which made the State a partner, to the extent of one-third, in all the reckless schemes that might be set afloat. The State issued its bonds to the amount named, and received company stock to the same amount in return. The plan of the Ohio Railroad Company was to run a line from the western edge of Pennsylvania to a point on the Maumee River, near the present city of Toledo. Two great cities were to be created as a part of the scheme. One was Richmond, on the Grand River, between Fairport, on Lake Erie, and Painesville, four miles to the south, and the other was Manhattan, on the Maumee River, three or four miles north of Toledo. There were other projects put forward, in the same year which saw the incorporation of the Ohio Railroad Company, that came to little or nothing in the forms in which they were then proposed. These were: The Cleveland, Warren & Pittsburg Railroad Company,186 leading from Cleveland to the State line, or some other point on the Ohio River in the direction of Pittsburg; the Cleveland, Columbus & Cincinnati Railroad Company, leading from Cleveland to Cincinnati by way of Columbus; and the Cleveland & Erie Railroad Company, from Cleveland to Ravenna. The panic of 1837 blocked these measures for a time. The subsequent history of each is practically the story of the railroads of Cleveland, and each may be taken up in the order of relative importance. The charter of the Cleveland, Columbus & Cincinnati Railroad was granted on March 14, 1836. It lay dormant until 1845, when it was revived, revised, and amended by an act of March 12th, so as to permit it to build as far as Columbus,. but not compelling it to go any further than that point. It also was permitted to "unite with any other, then, or thereafter, constructed under the authority of the general assembly, leading from any point at, or near, Lake Erie to, or towards, the southern part of the State. "187 A new company was organized, with John W. Allen, Richard Hilliard, John M. Woolsey, and Henry B. Payne, as the Cleveland directors, and John W. Allen, as president. The City of Cleveland, in encouragement of the enterprise, voted to loan its credit to the extent of two hundred thousand dollars. devote three months of earnest personal effort to one final attempt, and so well did they apply themselves that additional subscriptions to the amount of forty thousand dollars were obtained, and the skies began to clear. Alfred Kelley, then of Columbus, accepted the position of president, and thus a new source of influence and strength was added. Another fortunate move was made when the managers prevailed upon Frederick Harbach, Amasa Stone and Stillman Witt, to undertake the construction of the line; and they agreed to take the principal portion of their pay in stock. beginning. Alfred took a shovel and with his foot pressed it well into the soft and willing earth, placing a good chunk in the tranquil wheelbarrow close at hand, repeating the operation until a load was attained, and dumping it a rod or so to the south. We all shouted a good sized shout that the road was really inaugurated. Then Mr. Handy did a little of the same work as well as Sargent and Briggs, while I sat on the nearest log rejoicing to see the work going so lively and in such able hands. The fact was demonstrated that the earth was willing, if man would only keep the shovel, the pick and wheelbarrow moving lively according to this beginning. All that fall and winter one man was kept at work on the great enterprise simply to hold the charter, with a hope that something would turn up to enable the directors to push things with a greater show for ultimate success. During the winter that followed, any one passing up Pittsburg street near the bluff could see day by day the progress this one-man power was making in his work. Foot by foot each day the brown earth could be seen gaining on the white snow on the line towards Columbus, and hope remained lively in the breast of everyone that saw the progress, that if the physical powers of that solitary laborer held out long enough, he would some day be able to go to State’s prison by rail." joicing in the city, which now for the first time found itself in actual steam connection with the outside world. by discharges of artillery, and the welcome of thousands of our citizens." A grand procession was formed, and the guests were escorted to the Public Square, where an address of welcome was delivered by Mayor William Case. Hon. C. C. Converse, president of the State Senate, responded. 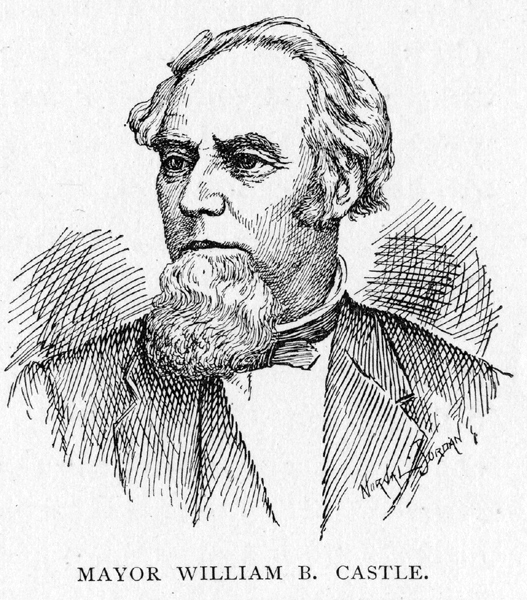 Samuel Starkweather then delivered the oration of the day, and speeches were made by Alfred Kelley, Henry B. Payne, Mr. Pugh, of Cincinnati, Governor Reuben Wood, and Cyrus Prentiss, president of the Cleveland & Pittsburg Railroad Company. The visitors were then taken to Hudson, over the last named line.190 On the return to Cleveland, a banquet was served at the Weddell House. A torch-light procession paraded, the city firemen taking a leading part. On the Sabbath, Dr. Aiken preached a powerful sermon on railroads in the Stone Church, and on Monday the visitors departed for home leaving Cleveland to settle down to the realities of every-day life. tion, the charter was broad in its scope and loose in its provisions. It allowed the president and directors to issue and sell stock to any limit that their desires or necessities might direct, gave them permission to select any route they might choose, to condemn land, and to propel their cars by any motive power they might prefer. The same evil days that befell the connection between the Forest City and Cincinnati, disturbed and delayed the venture toward the southeast, and the same revival of confidence that set the one afloat had a similar effect upon the other. 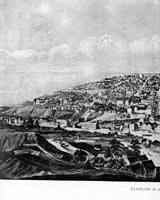 1852, the connection through to Pittsburg was arranged for. On April 18th, 1853, the Legislature of Pennsylvania passed a law incorporating the Cleveland & Pittsburg Railroad Company, and giving full assent to all the provisions of the Ohio charter. In October, 1871, the Cleveland & Pittsburg Railroad Company passed into the control of the Pennsylvania Railroad Company, where it has since remained. selected as the headquarters, and a purchase of land made that gave the road a foothold here. There was much surveying of proposed routes, and hesitation among those proposed, but finally the present one, through Mantua, Warren, and Youngstown, was chosen. Attempts were made to induce the Pennsylvania Legislature to allow an extension of the line into that State, but the influence of rival lines prevented. There was a fair promise of success up to 1854, when the annual report of the directors took on a tone of despondency that boded ill for the future. The condition of the money market had altered for the worse, and capital became very cautious; at this time, Jacob Perkins and his associates stepped in, and by pledge of their personal fortunes, secured the continuation of the work. In 1857, the road was completed as far as Youngstown, and a point thus reached where returns began to come in from the growing coal and iron regions. In October, 1863, it was leased to the Atlantic & Great Western Railroad Company, and later, with that organization, passed into the control of the Erie system. A detailed history of all the charters, acts, amendments, incorporations, and, above all, financial struggles, that went to build the half-score of minor roads finally merged into the Lake Shore & Michigan Southern Railway Company, would make a volume in itself, so only a bare outline is possible here. Trunk lines, with a through business to depend upon and a local traffic as incidental, did not enter into the calculations of the railroad projectors in the early days. Two or more cities having come to the conclusion that there was business and travel enough within their influence, and along the section of country to be traversed, to warrant a railroad, it was set on foot and the matter of extensions in any direction was left, generally, to be decided as an afterthought. After a time, a number of these disjointed sections would be joined by the absent links, and the great trunk line brought into being. The road under consideration is a marked example of this character. The links in this great chain may be briefly noted. The Erie & Kalamazoo Railroad was chartered in April, 1833, by the Territory of Michigan, with authority to construct a road from Toledo, Ohio, to a point on the Kalamazoo River; it built from Toledo to Adrian; and leased in perpetuity to the Michigan Southern Railroad, chartered in 1846. In 1835, the Buffalo & Mississippi Railroad, was chartered by the State of Indiana, to construct a road from the eastern to the western boundary line of that State. In 1836, its title was changed to the Northern Indiana Railroad Company. Eventually, under various acts, a line was constructed from the eastern to the western line of the State and from Elkhart to the northern State line, where connection was made with the above-named Michigan Southern road. State line, to intersect the road of the western division of the Buffalo & Mississippi Company. The road was immediately built between these points, a distance of thirteen miles. Manifest destiny and the present demands of the situation worked together for consolidation. On February 7th, 1855, a compact was entered into by which the Northern Railroad Company of Ohio and Indiana, the Buffalo & Mississippi Railroad (Western division) of Indiana, and the Northern Indiana & Chicago Railroad Company of Illinois, wee merged into one, which was called the Northern Indiana Railroad Company, and which gave a through line from Toledo to Chicago. Two months later a still more important step was taken, by which the above line was again consolidated, this time with the Michigan Southern Railroad Company, under the growing name of the Michigan Southern & Northern Indiana Railroad Company. In the year following, this new corporation obtained a lease of the Detroit, Monroe & Toledo Railroad, then unfinished, and this finally connected the points named in its title. on the Cleveland, Columbus & Cincinnati line, within thirty miles of Cleveland, thence, by way of Elyria, to intersect the Mad River & Lake Erie road at Bellevue or some other point, and thence on to Fremont; also, for a branch thereof from Elyria via Sandusky, to Fremont. It was this line, as mentioned above, that finally made use of the right of way belonging to the old Ohio road, or the "road on stilts," as it was often described. 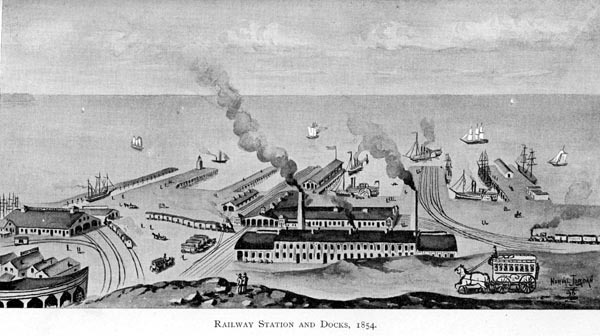 In March, 1850, the Toledo, Norwalk & Cleveland Railroad Company was incorporated, for the building of a line from Toledo, by way of Norwalk, to connect with the Cleveland, Columbus & Cincinnati Railroad at, or near, Wellington, and subsequent power was given it to continue the line on to Cleveland, either by an agreement with the last-named road, or independent of it. In October, 1852, the Port Clinton Railroad Company sprang into existence, with a mission to build a line from Sandusky, via Port Clinton, to Toledo. Finally, on July 15th, 19853, there was a grand consolidation of these small and irregular interests, and the result was that the Junction Railroad Company, the Port Clinton Railroad Company, and the Toledo, Norwalk & Cleveland Railroad Company, all disappeared from sight, to emerge as one in the Cleveland & Toledo Railroad Company. At that time not any of them had completed their lines, but the work was done subsequently by the consolidated company. the scheme, and this great railroad and commercial force of to-day became an accomplished fact. Of its extensions and dependent lines that were afterwards purchased, leased, or built, from various points on the main line to Oil City, Youngstown, Jackson, and other places in Pennsylvania, Ohio,. Indiana, Illinois, and Michigan, no mention in this connection can be made. A brief glance at the origin of some of the later railroads of Cleveland may be taken here, although some of them came into existence at a date considerably after the period now under consideration. On March 10th, 1845,the Franklin & Warren Railroad Company was chartered to build a road from Franklin, Portage County, Ohio, via Warren, Trumbull County, to the eastern State line, and having power to continue the same westerly or southwesterly. As a result, a line was built from the State line in Trumbull County to Dayton. By decree of court on October 17th, 1854, the name of this company was changed to the Atlantic & Great Western Railroad Company. This was later incorporated with other roads under the same name; and after many years of financial trouble it became known in 1880, as the New York, Pennsylvania & Ohio Railroad Company, and later, in company with its Mahoning line into Cleveland, already described, became a part of the Erie system and as such connects Cleveland with both the east and the west. sylvania system in 1869, and thus secured connection with Cleveland. The Lake Shore & Tuscarawas Valley Railway Company was incorporated on July 2nd, 1870, its declared purpose being to build a road from a point near Berea to Mill township, Tuscarawas County, on the line of the Pittsburg, Cincinnati & St. Louis road, with a branch from Elyria to a convenient point on the main line in Medina County. The road was built from Elyria, via Grafton, to Uhrichsville, and completed in August, 1873. In October, 1872, the company purchased from the Elyria & Black River Railway Company eight miles of the line of the latter, extending northward from Elyria to Black River harbor, now known as Lorain. In 1875, the Cleveland, Tuscarawas Valley & Wheeling Company was incorporated, and all of the above property passed into its possession, under sale by the courts. An extension through to Wheeling, West Va., was completed in 1880; and soon after that the whole line became known as the Cleveland Lorain & Wheeling Railroad Company. mortgages.193 An attempt was made, before construction commenced to make the city a part owner, and a vote taken as to whether bonds should be issued for that purpose. The answer at the polls was a negative. The enterprising business men of Cleveland went to work, however, and raised five hundred thousand dollars in subscriptions, and thus made the road a possibility. Valley, under the name of the Connotton Valley Railway Company. The line was pushed down to the present depot on Huron and Ontario streets. It was sold by the court, on May 9th, 1885, to the stockholders and bondholders, who reorganized it in the following month, under the name of the Cleveland & Canton Railroad Company. The charter for the construction of the New York, Chicago & St. Louis road, from Buffalo to Chicago, via Cleveland and Fort Wayne, was issued under the general railroad law of New York, on April 13th, 1881, and the construction was commenced in the same year. The road was opened for traffic on October 23rd, 1882. It was sold soon afterwards to William H. Vanderbilt, and is still a part of the great Vanderbilt system of western roads. Cleveland, which embraced "all of the ten-acre lots, and all the unsurveyed strip lying along the bank of the river north and south of the mouth of Kingsbury Run." In 1848, the first Superior Court of Cleveland was created, with Sherlock J. Andrews as judge, and George A. Benedict, clerk. It continued for the period of five years, but was dispensed with on the revision of the judiciary system, under the new State Constitution. 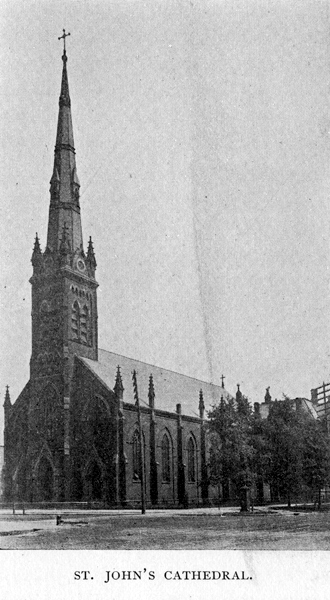 In the fall of the same year the corner-stone of St. John’s Cathedral, on Erie and Superior streets, was laid. had been felt and discussed for some little time. The records of the Board, previous to 1864, have been lost, or destroyed, and the chief sources of information concerning it are found in the newspapers of the day. In the "Herald" of July 8th, 1848, we find the following: "At a large meeting of the merchants of the city, held, pursuant to a notice, at the Weddell House on Friday evening the 7th, William Milford, Esq., was called to the chair, and S. S. Coe appointed secretary. After a statement from the chair of the object of the meeting, on motion by Joseph L. Weatherley: Resolved, That the merchants of this city now organize themselves into an association to be called The Board of Trade of the City of Cleveland." Some of the best known of the early members were Joseph Weatherley, R. T. Lyon, Richard Hilliard, L. M. Hubby, Philo Chamberlain, Charles Hickox, Thomas Walton, S. S. Stone, R. K. Winslow, W. F. Otis and Sheldon Pease. The first officers were: Joseph L. Weatherley, president; W. F. Allen, Jr., vice-president; Charles W. Coe, secretary; R. T. Lyon, treasurer. At a later date, we shall see how much has grown from this humble beginning. Hutchinson, George King, Benjamin Bissell, Samuel Raymond, Richard Hilliard, L. M. Hubby, Thomas Miller, and A. O. Blair. The college building, in which this useful institution was first located, was at the corner of Prospect and Ontario streets. It was at this point, in 1852, that considerable damage was done to the building and its contents by a mob of several thousand people, who were incited thereto by stories of stolen bodies being traced to the college dissecting room. 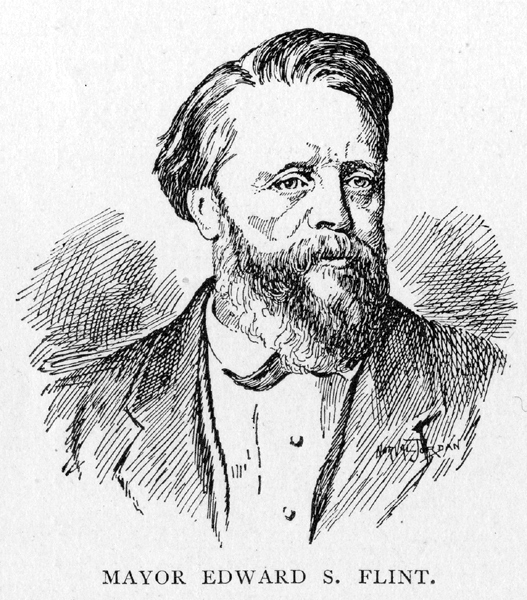 The college had an honorable and useful career, not only in connection with its educational work, but through the hospital under it control. The second home of the college was in a church building, formerly owned by the Congregationalists, on Prospect street, a little below Erie street. It remained here for several years, working in connection with the Homoeopathic Hospital, on Huron street, In 1890, the college became divided into two schools, one taking the name of the Cleveland University of Medicine and Surgery, with headquarters on Huron street, and the other, the Cleveland Medical College, located on Bolivar street. The Cuyahoga County Agricultural Society also was formed in 1849, and for a number of years its fairs were held on Kinsman street (now Woodland avenue), and later at Newburg and Chagrin Falls.